The Singapore Police Force (SPF) was one of the 14 government agencies which received OpenGov’s inaugural Recognition of Excellence Awards held at the 3rd annual Singapore OpenGov Leadership Forum on May 18 2017. 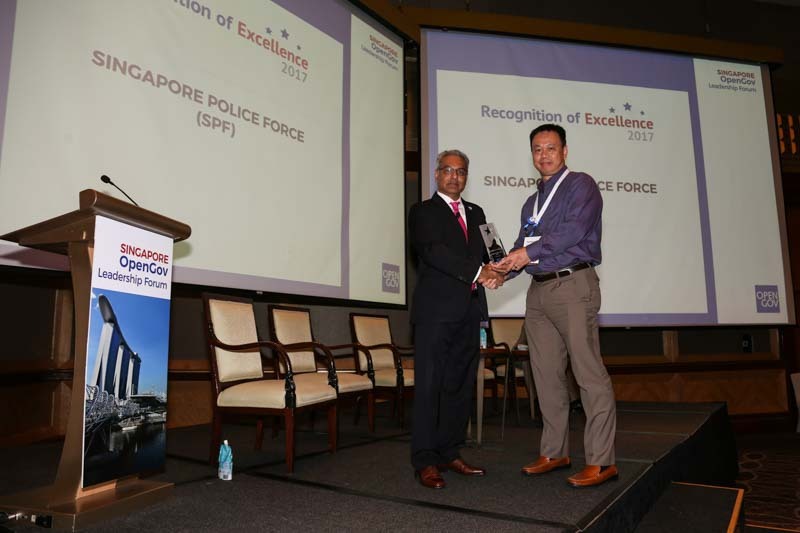 SPF was recognised for leveraging technology to defend the residents of Singapore against threats, old and new. A one-stop self-help portal, https://www.scamalert.sg/ was launched to counter scams. It provides up-to-date information on the latest scams. People can share personal experiences of scam encounters and lodge police reports online. There are links to major online e-commerce platforms so that the public can approach the platform administrators for assistance regarding transactions on these platforms. Victims of scams will also be able to lodge reports for police investigations via SPF’s Electronic Police Centre. Another SPF initiative is the Digital Evidence Search Tool (DIGEST) which will automate the forensic processing of huge volumes of data, enabling investigation officers to focus their efforts on more specialised investigation functions. In a follow-up email interview, OpenGov had the opportunity to find out more from Mr. Tay Yeow Koon, Director, SPF about the ongoing technology projects as well training/curriculum developments at the organisation. How can technology in general and ICT specifically help the Police Force to do its job better? Through developing new capabilities and enabling technology in line with the Operations Technology Vision (OTV) to provide effective and timely ICT support, solution and services, it will help SPF in the mission to prevent, deter and detect crimes. Would you like to share any ongoing technology-related projects or initiatives at SPF with our readers? Police Cameras (PolCam) distribution continues to achieve good progress. Since the project started in April 2012, we have installed 62,000 cameras in around 10,000 public apartment blocks and multi-storey car parks under the PolCam 1.0 rollout plan. These PolCam has provided valuable footages which has assisted SPF in the solving of more than 1,100 cases. We are now expanding the programme with PolCam 2.0, which is the installation of cameras to public areas in town centres, neighbourhood centres, hawker centres and walkways leading to transportation nodes such as MRT stations and bus interchanges. About 11,000 more cameras will be progressively installed over the next few years at 2,500 locations islandwide. 5100 Polcam 2.0 cameras will be rolled out by end of this year. We have rolled out force-wide systems such as the Body Worn Cameras (BWC) and In-Vehicle Video Recording System (IVVRS). The BWC is a new recording gadget where we put on the frontline officers to enhance their crime-fighting capabilities. The IVVRS involve installation of cameras on police vehicles to give us situational awareness of the external surroundings around the vehicles. It will also be able to “live” stream videos from the vehicles back to Command Centres. More than 400 patrol vehicles will be fitted with IVVRS by June 2017. Our core system, MHA Communications Network 2 (MCN2) is the new radio communications system implemented to support the operations of SPF, SCDF and SAF. The system comprises of various sub-systems such as the Trunked Radio System (TRS), Digital Multi-Channel Recorder (DMR) and network security systems. As the existing SPF’s incident management capabilities rely on the accessibility and dissemination of real time information, a private and dedicated wireless broadband network is required to overcome the problem of Telco congestion during major events like IISS, SEA Games, National Day Parade, GE, F1, Christmas, etc. Currently, we are exploring and trying out the LTE Technology to allow reliable and stable video streaming for near real-time situation awareness. What is SPF’s role in initiatives such as Scam Alert and SGsecure? c. Direct links to facilitate the lodging of police reports through SPF’s Electronic Police Centre. As part of the counter-terrorism measures for SGsecure, we have strengthened the security at buildings and premises, including entertainment centres and shopping centres. CCTV coverage has been significantly expanded to allow SPF to better deter, detect and solve crimes. In the digital age where cyber-related crimes such as online scams and frauds are getting increasingly common, how does SPF make use of technology and training to make sure they ahead in the fight against cyber-related crimes? The CyberCrime Command (CCC) within CID was set up in 2015 to serve as a cybercrime investigation, forensic and policy entity for the SPF. The CCC comprises of the Technology Crime Division (TCD) in CID, as well as full-time Cybercrime Response Teams (CCRTs) at the six Land Divisions. This new establishment allows SPF to have the capacity to deal with the increasing demand for quick investigation and computer forensics support for cybercrimes, and also work closely with other law enforcement agencies and industry stakeholders to prevent, deter and detect cybercrimes. d. Stepping up partnerships and international engagement. In the area of educating and empowering the public to stay safe in cyberspace, SPF have leveraged on technology to spread crime prevention messages to the public at large (e.g. Scamalert.sg website). In addition, SPF have extensively utilised digital platforms such as YouTube, Facebook, Twitter to raise public awareness and vigilance to reach out to the online population. Crime advisories through SMS broadcasts have also been employed especially in cases where scams are targeted at a specific group/s. SPF also actively works with various e-commerce platforms and e-banking sites to place crime advisories prominently. This is especially pertinent as many of the scams we see are not new, but they have evolved to online platforms. Hence, moving forward, SPF will continue to step up efforts to bring scam awareness message to the online population. In the area of cybercrime enforcement, the CCC has embarked on several new technology initiatives to boost cybercrime investigation capabilities to handle the large volume of digital information related to reported cybercrime cases expeditiously for faster case resolution. One such initiative is the DIGital Evidence Search Tool (DIGEST), which will automate the forensic processing of voluminous data. This will in turn lighten the workload of investigation officers, and enable investigation officers to focus on more specialised investigation functions. The tool will also reduce the processing time for digital evidence, ensuring that investigation officers can follow up on leads expeditiously, and solve cases in a shorter time. The CCC has also incorporated cybercrime modules in the basic training for new Police officers, as well as in the different training courses for investigation officers so that officers are able to recognise, collect and preserve digital evidence. At the regional level, Singapore is the Association of Southeast Asian Nations (ASEAN) Voluntary Lead Shepherd on Cybercrime, responsible for charting ASEAN’s initiatives against cybercrime. The CCC has co-hosted several training programmes and workshops for ASEAN Member States with our partner countries and the INTERPOL. This includes the two-year (2016 – 2018) ASEAN Cyber Capacity Development Project funded by Japan and implemented by INTERPOL, the Singapore-United States Third Country Training Programme, and the ASEAN Plus Three Cybercrime Workshop, involving the People’s Republic of China, Japan and the Republic of Korea. The involvement of key Asian partners, ASEAN Member States and INTERPOL facilitates an effective environment for collaboration on cybercrime issues, which is anchored in Singapore. This environment enables the sharing of best practices between countries and across regions, and the forging of effective operational links to tackle cybercrime. The Alliance of Public PrivAte Cybercrime STakeholders (APPACT), a new public-private industry engagement platform was also formed by the CCC for SPF and private stakeholders to work together to raise the awareness of cybercrimes in the private sector. This is accomplished through strategic information sharing and joint development of cybercrime fighting response using the APPACT platform.